Â Â Â Open to swimmers aged 0 to 7 years old, the Splash Pool has plenty of edge around it for supervising parents (or older sisters) to sit comfortably. I recommend you wear your swimming suit, though. You never know when a big splash may drench you, a preschooler may wrap you in a soggy hug, or an over-confident toddler may need rescuing from her face float. Donâ€™t forget to put your diapered babies in a swim diaper AND plastic pants, you can purchase them there but you have to have exact change. And youâ€™ll need your proximity card to get into the pool, but you can invite non-Daybreak resident friends and family members to join you for cheapâ€”$2 per child and free for adultsâ€”and cheap is always nice these days. 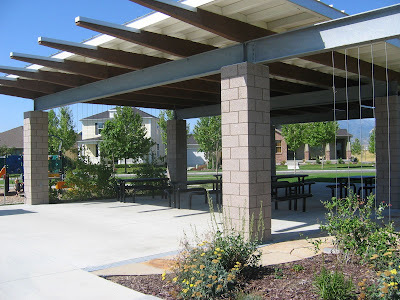 Â Â Â Right next to the Splash Pool sits a fun little playground and large pavilion with several shaded picnic tables. Itâ€™s a great place for a party, with patio space for extra chairs and tables, barbeque pits, and even public bathrooms. You can reserve the Founderâ€™s Park Pavilion on the Daybreak Living website for a refundable $50 fee which gets you access to garbage cans and the water tap. Since I only planned to use one table for our little birthday bash, I checked the calendar to make sure the pavilion would be free but didnâ€™t bother reserving it. I wouldn't have minded sharing the pavilion with anyone else who dropped by the park. A warning to party planners: bring RAID and a yellow-jacket trap! I left my cake covered in foil and sitting on the table and came back to find it enveloped in bees. 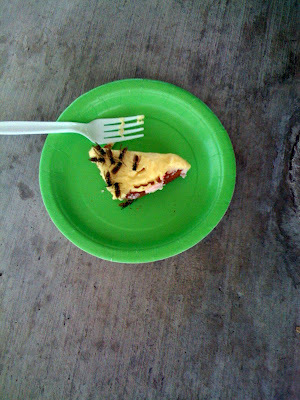 We managed to rescue the cake from the swarm but ended up spending the rest of the party running around with our pieces of cake, trying to stay away from yellow-jackets. Luckily no one was stung but it was not exactly a peaceful, friendly gathering. 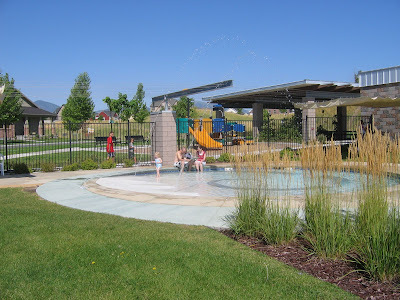 Â Â Â But in spite of the uninvited insects, my daughter and her little guests had a great time partying together in the sunshine at the Splash Pool and Founderâ€™s Park. It turned out to be yet another family experience when I reflected on how glad I was to live in such a beautiful community with so many funâ€”and freeâ€”activities for us to enjoy. Â Â Â The Splash Pool is open from 10:00 am to 8:00 pm every day, 10:30 am to 5:00 pm Sundays.